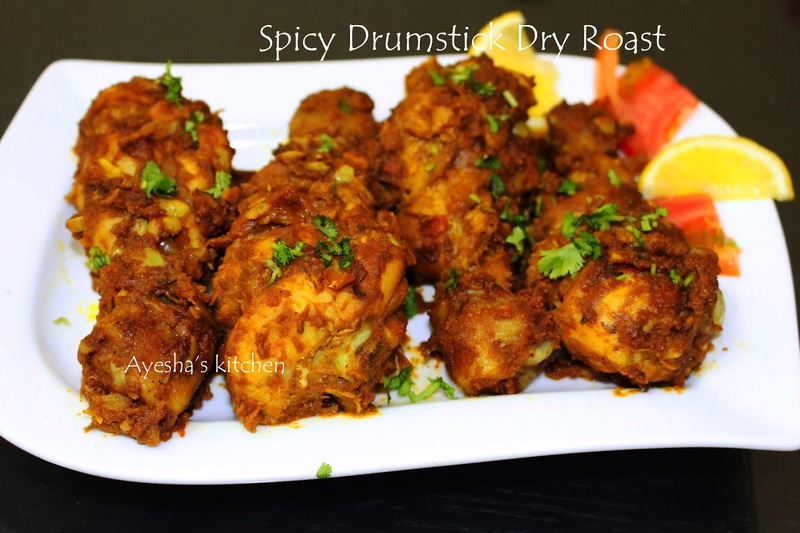 Chicken Drumstick dry roast is an Indian chicken recipe which is a very popular and favorite recipe for generations. It is very tasty when prepared with all those Indian spices and cooked until tender. On the other side, it disappoints us when it is not properly marinated and cooked. Keep in mind ...always roast drumstick very well over a low flame and always make the best or good chicken marinade which will results in a heavenly taste. 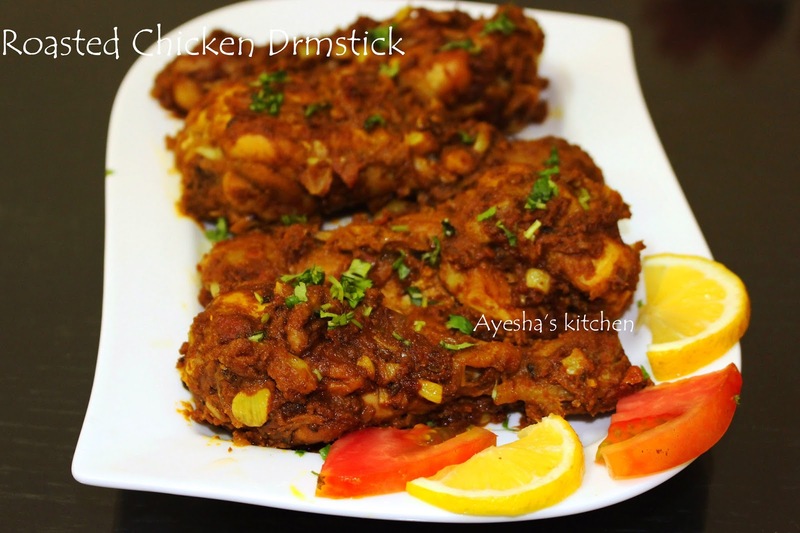 The same recipe can be followed for chicken thigh recipes. Once I tried the same with Potato (Aloo), which is a great substitution for chicken (always on the top of Indian food names). This roasted chicken drumstick recipe is a Mangalorean recipe with few changes to suit my taste. This is an oil-free food / oil-less cooking / Zero oil recipe. But for a fine aroma and yummy look just sprinkle 1 tbsp of coconut oil on the top and toss the chicken for one minute on high flame finally. This really makes the difference in taste and texture. Do try this yummy roast chicken drumstick recipe /no oil cooking recipe. Here is the recipe showing how to cook spicy chicken drumstick roast. Hope you love this spicy dinner recipe. Clean the drumstick very well and make slits with a sharp knife on each drumstick. Drain the excess water with a tissue paper and set aside. Now grind together coriander powder, chili powder, turmeric powder, fennel seed powder, curd, ginger garlic chopped to a fine paste. Transfer it to a bowl and add chopped onion, tomato chopped to it. Combine well and press it tightly with your hands to make a thick mixture. Do not add water. Finally, add salt and marinate the chicken drumstick well with this mixture. The marinade should reach inside the slits also. Transfer it to a nonstick vessel, line them close to each other, coat well with the mixture ( pour the remaining whole marinade mixed with a quarter cup of water over it) and switch on the flame. Make the flame to low and close the lid. Do not add more water. Let it cook for 10 minutes. Check occasionally. Flip the other side and cook for another 10 minutes. The chicken will release some water now. So open the lid and let it cook well until the drumstick is well coated with the masala. When all the water gets evaporated and the chicken is well coated with the gravy, add 1 tbsp or more coconut oil and toss well on a high flame for one minute. This will gives a fried texture and looks yummy. Slow cooking chicken drumstick tastes best.